For those of you who are not aware, the Sogetsu School of Ikebana Victorian Branch is currently having an exhibition until 8th August at Melbourne Style Gallery, 155 Clarendon Street, South Melbourne between the hours 10.00am and 4.00pm. I have included here some photographs. Please go to our website to see all the arrangements. 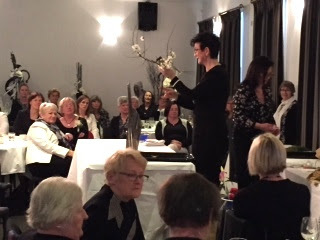 Last week, I was privileged to be invited to demonstrate for the annual luncheon of the Sale Floral Art Group. Lucy volunteered to come along to assist and I'm so glad she did because I could not have done it without her. She and I have been working together for so long that she can anticipate my needs, thus making her the perfect assistant. I had prepared 11 arrangements, which I packed very carefully to make them fit into my little Honda Jazz, leaving no room for visibility through the rear vision mirror. Lucy took the wheel for the 2.5 hours' drive there (whilst I ate breakfast) and I drove back. 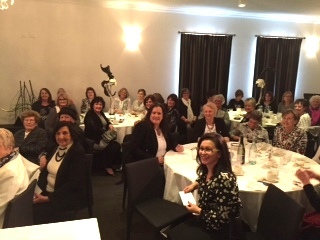 We were treated to a delicious lunch at The Criterion Hotel along with the 120 guests. And for dessert there were plates of a variety of the most delectable 'slices' made by members of the group. They say that confession is good for the soul, so I'm confessing that I ate a lot more that I should have. As for the demonstration itself, I felt it went very well judging by the feedback we received. There were people who told us they had never seen anything like it before and one lady who said she was 'blown away'. I had been dealing with Heather Harrington who, together with all the other members of the group, went out of her way to make us feel welcome and to provide anything we needed. We were really made to feel special. The theme for the day was 'Black and White'. The room was decorated appropriately and everyone, who attended made the effort to dress accordingly. A workshop was held the day before to create the smart, black and white arrangements on the tables. I started with a black and white arrangement. The arrangement below is one I donated to the group for auction, which created a little bidding war between a lady at my table and the manager of the hotel. He bought it, finally, for $90.00 and proudly displayed it at the bar of the hotel. As I mentioned before, we were made to feel very special by the organizers and guests alike and in the end I was presented with this beautiful Japanese container. Today I went to class at Elizabeth's and, of course, I had to use it. 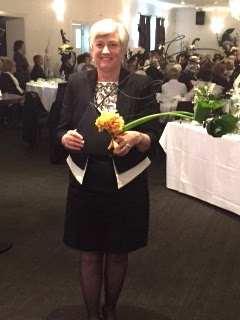 The theme was a 'Green Arrangement' and I used New Zealand flax, calla lily buds and leaves.